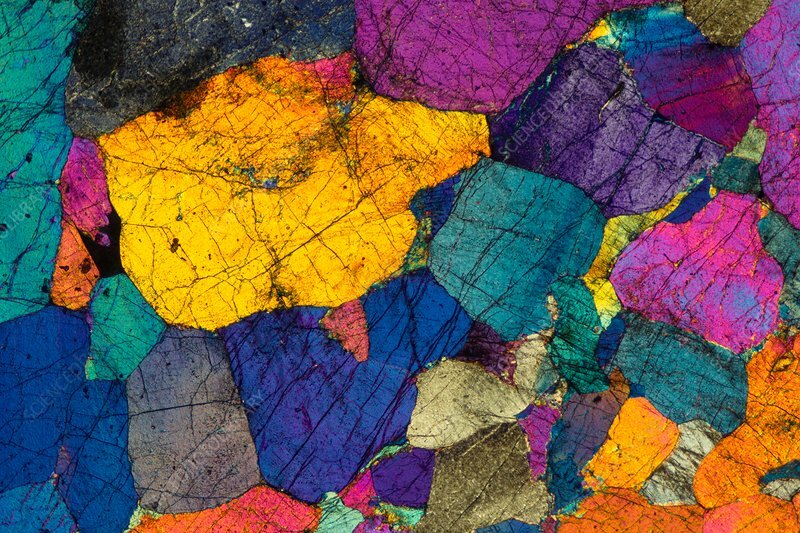 Peridotite, polarised light micrograph. Peridotite is a dense, coarse-grained igneous rock consisting mostly of the minerals olivine and pyroxene. Peridotite is ultramafic, as the rock contains less than 45% silica. It is high in magnesium, reflecting the high proportions of magnesium-rich olivine, with appreciable iron. Peridotite is derived from the Earth's mantle, either as solid blocks and fragments, or as crystals accumulated from magmas that formed in the mantle. This specimen is from Italy. Horizontal object size of this section: 5.0 mm.